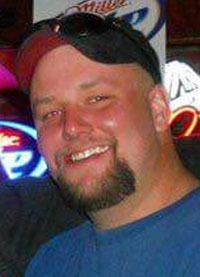 Obituary: James “jimmy” Robert Randall, Jr.
James “Jimmy” Robert Randall Jr, born February 7, 1983, left this life in a vehicle accident on November 19, 2016. James was baptized and confirmed in the Missouri Synod Lutheran faith. He attended grade school and high school in Berthoud, and afterwards, obtained his journeymen’s electrical license. James spent time in Iraq, loved his Harley and worked to support his love of hunting. James is survived by his father James Randall of Mead; mother Jeanette Randall of Berthoud, brother Jacob Randall and girlfriend Autumn Frank of Berthoud; adopted brother Jason Sobczak of Colorado Springs; grandparents Wes and Dorris Riewe of Longmont; grandmother Margery Wamser of Edgewater, Colorado; uncles Myron Riewe of Berthoud, Richard Randall of Denver, Sammuel Randall of Nebraska and Jeffrey Wamser of Kansas; aunt Eileen Riewe of Longmont; many nieces, nephews, cousins and friends; as well as his faithful dog LeRoy. He was preceded in death by his great-grandmother Stella Wittrock and grandfather Lee Randall. A memorial service to celebrate the 33 years and 9 months we were blessed with will be held at Mount Olive Lutheran Church, 3411 S. Taft Ave., Loveland, Colorado on Saturday, November 26, 2016 at 10:00 a.m. Private inurnment will be held at a later date. In lieu of flowers, it would be greatly appreciated to have donations made to the James R. Randall Jr. Memorial Fund c/o of Viegut Funeral Home. Go to www.viegutfuneralhome.com for condolences. Site contents copyright © 2019 Recorder Online	except as noted. All rights reserved. | 88 queries in 2.263 seconds.